Since I came back from my overseas trip, a lot of things have changed in the garden. The blistering 40 degree weather had killed a few young plants I planted. It also burned a lot of leaves, and my zucchini plant has stopped producing fruit with the onset of the cooler weather. Therefore, I was overjoyed when I spotted a single basil bush growing under the shade of the elderflower shrub. Usually basil requires full sun – but because of the extreme weather we have been receiving – it is thriving in the semi shaded position. Looking so healthy, I couldn’t help but to think of things to make with the basil. The very first thing that came to mind was a pesto. 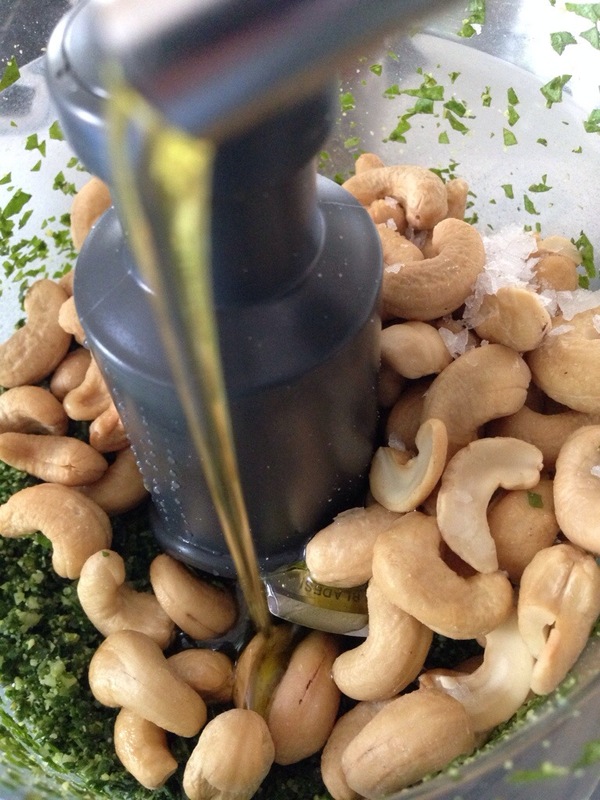 Then I saw a packet of cashew nuts on the kitchen counter – and in an instant, lightbulb moment flash I decided to make a Basil & Cashew dip. 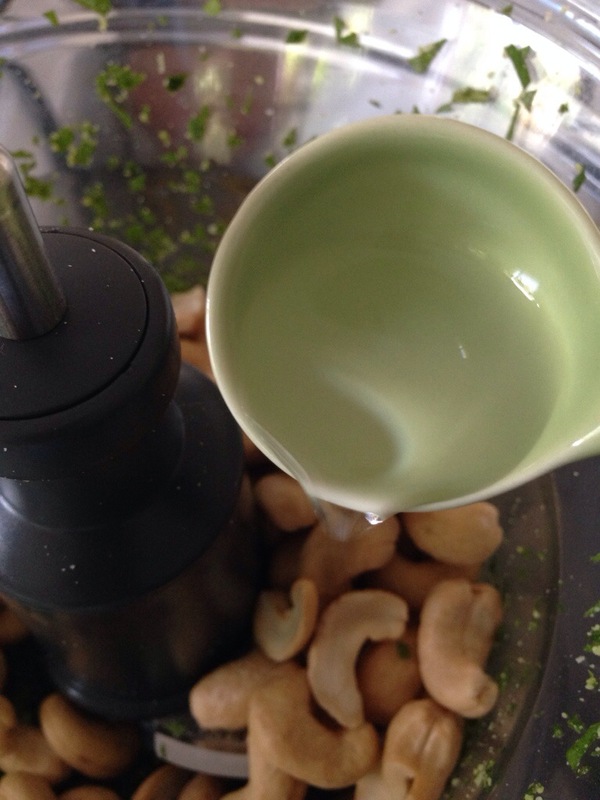 Truth be told it tastes exactly like pesto – except the cashews give it a good ‘body’ and texture – so you can eat it just like that. 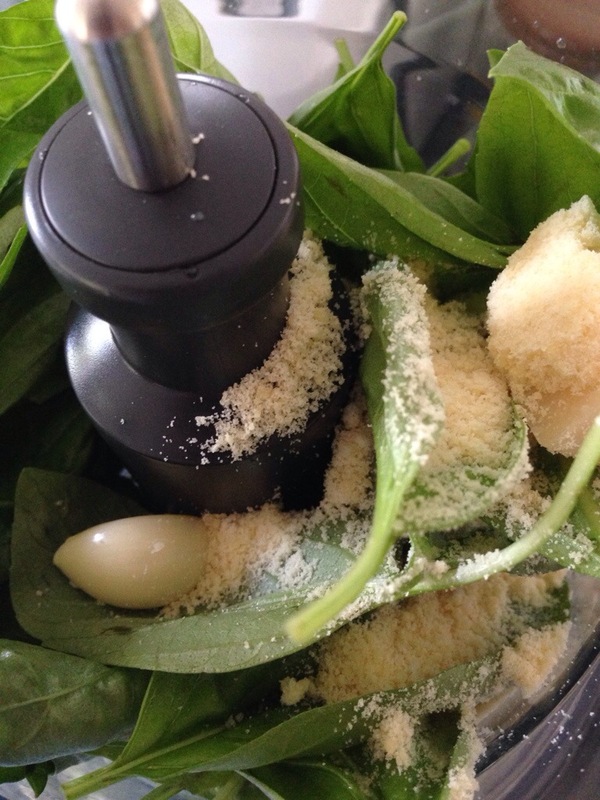 – The first thing you want to do is to put the basil, garlic & cheese in a food processor. 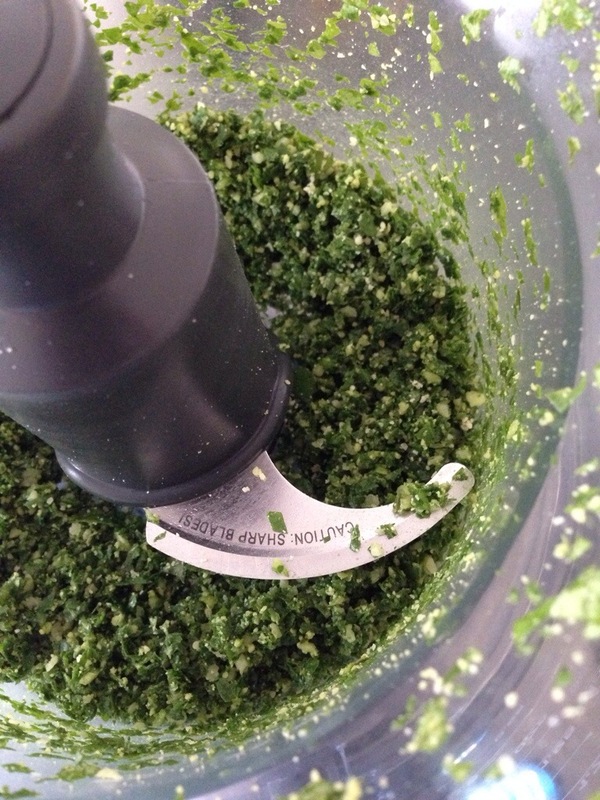 – Next, pulse the ingredients until the basil & garlic is finely chopped. If you are using cheese straight from the block, make sure is finely chopped too. I used some leftover lazy parmesan and some block Grana Padano to make up the difference in weight. 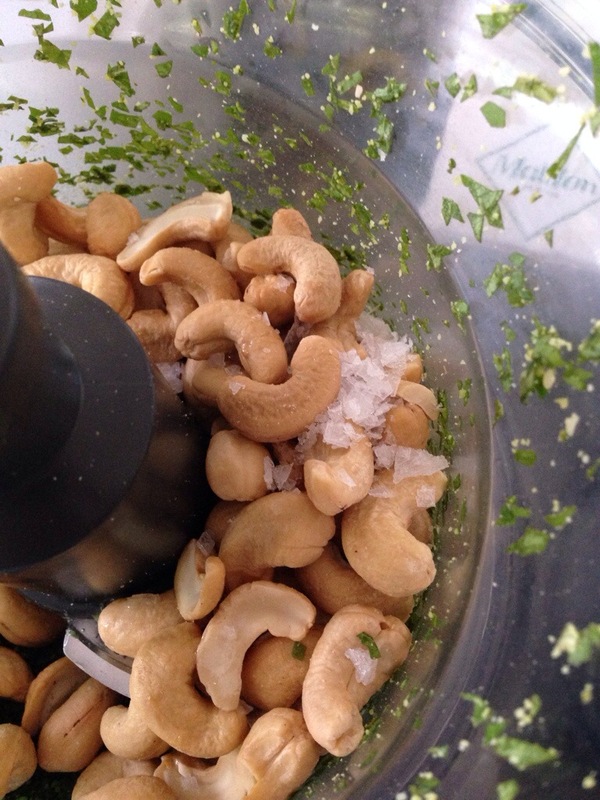 – Add the cashews, vinegar, salt & oil to the basil mix, and pulse intermittently until the cashew nuts are broken up into chunks, but don’t take it too far or you will lose that lovely crunchy texture. 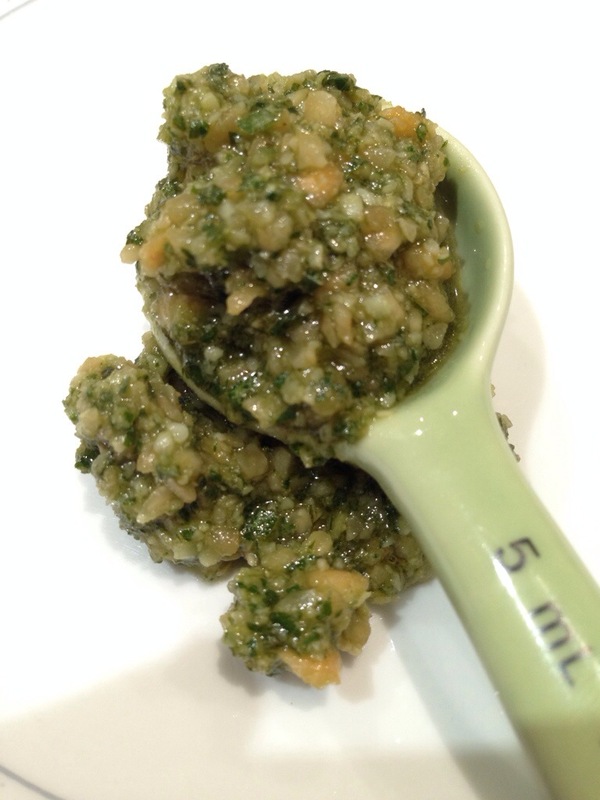 – Add extra oil if the mix is too dry and stir it through. – After that, is just a matter of bottling it up and waiting until tomorrow to eat it along with chopped carrots, cucumber, biscuits – anything that takes your fancy. I do recommend eating this the day after – all the essential oils from the basil, garlic & cheese would have permeated through into the olive oil – evening up the taste. I used extra virgin olive oil which does take over the other flavours – if you eat it immediately. Therefore, again, leave it overnight for the basil, garlic & cheese to really infuse through. Although I did mention 1/4 cup of oil, you may need more or less – it’s really up to your preference. I wanted a dip with some body to it so that it would be picked up on anything I dipped into it. Don’t make it too dry or it’s just not a dip – nor too oily or it just becomes … too oily and rich. Hello there, simply become alert to your weblog via Google, and found that it’s truly informative. I’m going to watch out for brussels. I will be grateful when you continue this in future. Many other folks will be benefited out of your writing. Cheers!